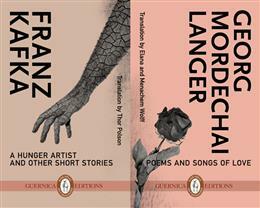 En Attendant Demain’s Marie Côté recently reviewed A Hunger Artist & Other Stories; Poems and Songs of Love by Franz Kafka & Georg Mordechai Langer, translated by Thor Polson and Elana & Menachem Wolff. The flip book was published by Guernica Editions in Fall 2014. Côté describes the impression the book made on her as she read, and makes note of the baffling and surreal nature of the short stories. Though she can’t read Hebrew, Marie Côté is confident in the quality of the translation of Poems and Songs of Love. Tagged with A Hunger Artist & Other Stories; Poems and Songs of Love, Elana Wolff, En Attendant Demain, Franz Kafka, Georg Mordechai Langer, Menachem Wolff, Thor Polson.